In 1970, I traveled to the United States for the first time, staying two months with relatives who lived in Crown Heights, Brooklyn. While there, I prayed at Chabad Headquarters at 770 Eastern Parkway, and I requested a private audience with the Rebbe. Although my appointment was set for 11 p.m. on the night of the 30th of July, I had a long wait. It turned out that a delegation on behalf of Torah Umesorah, the National Society for Hebrew Day Schools, had come to speak with the Rebbe as well as other important people, and so I only went in at 6 a.m.! Despite the late hour, the Rebbe spent twenty-two minutes with me, not rushing me at all. When I entered, he greeted me warmly, invited me to have a seat, and started reading the letter in which I listed – as I had been instructed in advance – all my questions, dealing mostly with the activities of the Center for Torah Libraries. Then he very patiently began to address my questions one by one. He strongly encouraged the idea of the Center for Torah Libraries, and he gave it his blessing. He said that he saw great importance in strengthening holy literature as a counterweight to all the harmful literature that is published elsewhere. We also spoke about our endeavor to classify Torah publications, and our most recent innovation – a detailed index of Torah articles published in various journals, making it easier for researchers to find materials on specific topics. Having studied in Berlin and Paris, the Rebbe knew how things were organized in large university libraries. He noted that such libraries give great importance to bibliographies, but that Torah libraries don’t, and there exists a terrible need for this in the Torah world. Therefore, he urged us to continue to publish our indexes of Torah literature in order to give more people access to various subjects. Then the Rebbe, with his vast vision, proposed an original idea which we weren’t even considering. 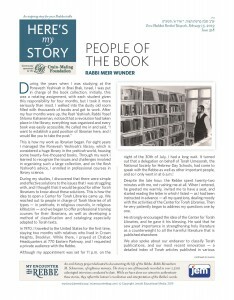 Those of us working as librarians in Israel were mainly catering to a limited local circle of Hebrew speakers, but the Rebbe said that today academic institutions and public libraries in the United States and in the world at large were beginning to show interest in Jewish literature, and they were opening special departments devoted to this subject and also buying Jewish books. He encouraged us to think with a bigger picture in mind and to make sure that our publications would also be accessible in English. As he spoke, the Rebbe continued to take me by surprise. “A Torah library is intended for Torah-observant people looking for holy books,” he said, “but what about other people – those who would be too intimidated to enter a Torah library? How will they come upon these treasures?” He then suggested that we ask every public library to establish a section of Torah literature. This way, the general Jewish public will chance upon these Torah books and will be exposed to their message. We hadn’t even considered this possibility, but this original idea – which went along with the Rebbe’s general approach to outreach – has since become a reality. Today, many public libraries contain a section of basic Jewish literature. Also regarding the Torah libraries, the Rebbe stressed that we shouldn’t wait for people to come to our libraries on their own initiative. Rather, we should reach out to them. He encouraged me to host events – such as lectures or concerts – and advertise them in order to attract people who wouldn’t come of their own accord. I had confided in the Rebbe that our budget was very tight, because we didn’t have any sources of funding, and he pointed out that widening the circulation of our publications could serve as a source of income. I had also questioned whether I could approach people and charitable foundations for donations, being unsure if Torah libraries classified as a proper charity according to Jewish law. The Rebbe removed all doubts and stated explicitly that supporting Torah libraries is a charitable endeavor and that we could finance our activities with money from donations. In the following years, we did raise the necessary funds, and the activities at the center did expand. We offered more cataloguing courses; we also published various instructional materials; and we assisted new libraries that opened up. As a result, Torah libraries today are professionally organized, properly catalogued and easily accessible. In addition, my conversation with the Rebbe was reported in a number of publications, and it had a big impact on the availability of Torah materials in English, which became accessible to those who are as-yet far from Judaism. For this, the Rebbe’s gets much credit. Rabbi Meir Wunder is the founder and director of the Center for Torah Libraries. He was interviewed in his home in Jerusalem in February of 2011.